As much as I try not to play favourites with any one group of insects, I must admit I have a particular fondness for Jewel Beetles. Any time I go out on a hunt with the camera, especially if I’m going to an area where there is an abundance of flowering plants, I always hope to see some of these wonderful little creatures. I love the variety of colours that can be found in nature and Jewel Beetles provide some of the greatest examples. 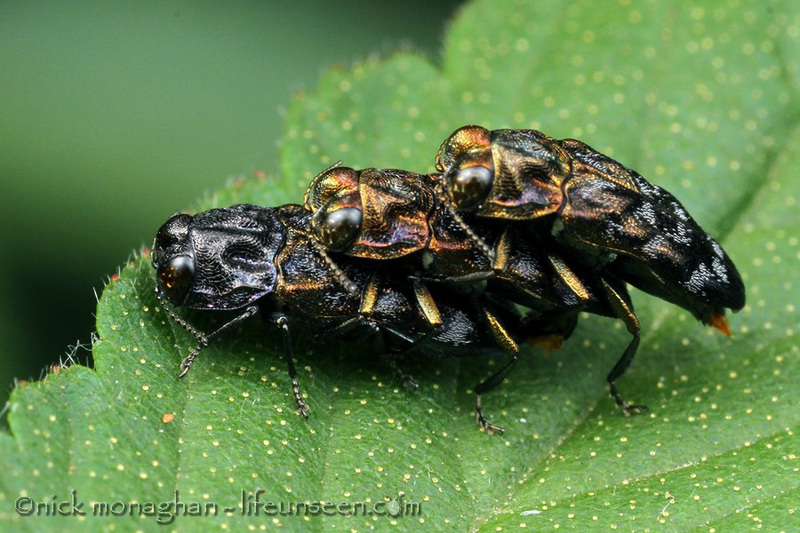 Three’s company – A second male Aaaba sp. is trying to interrupt this mating pair. Mt. 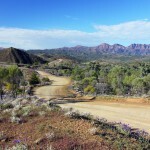 Glorious, Queensland. Jewel Beetles belong to the rather cosmopolitan family called Buprestidae and there are approximately 15,000 species worldwide, with around 1,200 found right here in Australia. The variety of sizes and colours is staggering and they can be anything from fairly plain to impossibly beautiful. Naturally, I am very eager to find one of the richly coloured species, but it is a joy to find any of them, although it can be quite a challenge to get a photo. Jewel Beetles tend to be rather skittish creatures and they are quick to fly away or drop to the ground when disturbed. This is a great test of my resolve and patience and I have often been left feeling frustrated when the beetles refused to sit still or they took off before I could get close enough for a decent shot. Nowadays I have a better understanding of their “personalities”, so I am gradually becoming more successful at photographing them, but there are always a few that manage to elude me. Getting one good shot can completely make my day. Three species of Castiarina. 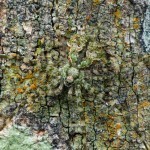 Left to right: C. bella, C. erythroptera and C. sexplagiata. As I mentioned, flowering plants are usually the best places to see Jewel Beetles because they love a good feed of nectar. Most of the species I have found have been feeding on Bursaria, Calytrix, Cassinia and Leptospermum and I have come across one or two on Senecio flowers. Different species seem to peak at different times and it seems to correspond with particular plants being in flower. For example, there is a stunning little metallic purple and green beetle called Melobasis purpurascens that I find every year, but only in December/January and only on one particular Cassinia shrub on the banks of the Yarra River in Mt Lofty Park, Victoria. I’m sure it has to be found elsewhere, but that’s the only place I have seen it so far. 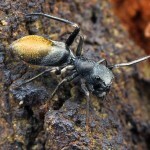 Three species of Diphucrania, all from Victoria. 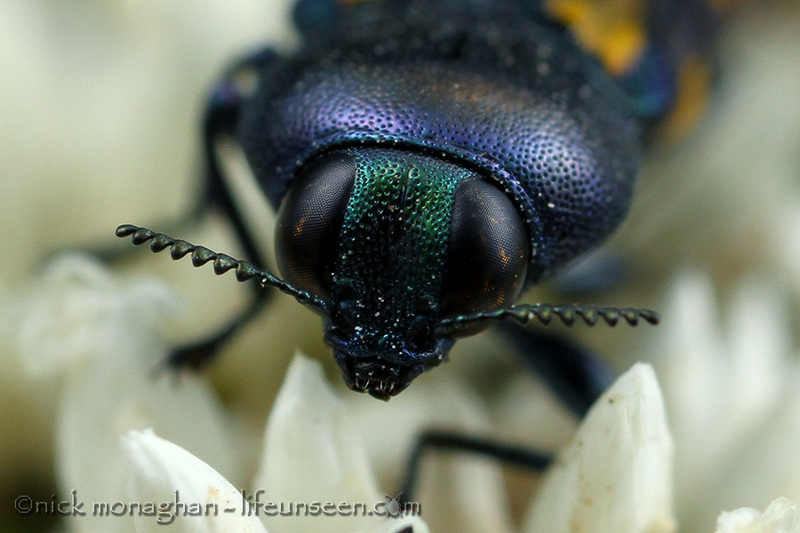 I have been immersed in insect photography since 2005 and during the first five years I only managed to capture five species of Jewel Beetles. Another five years on and my collection has grown to 41 species, which is a great improvement but still nowhere near enough. Hopefully I can share with you many more species over the coming years. 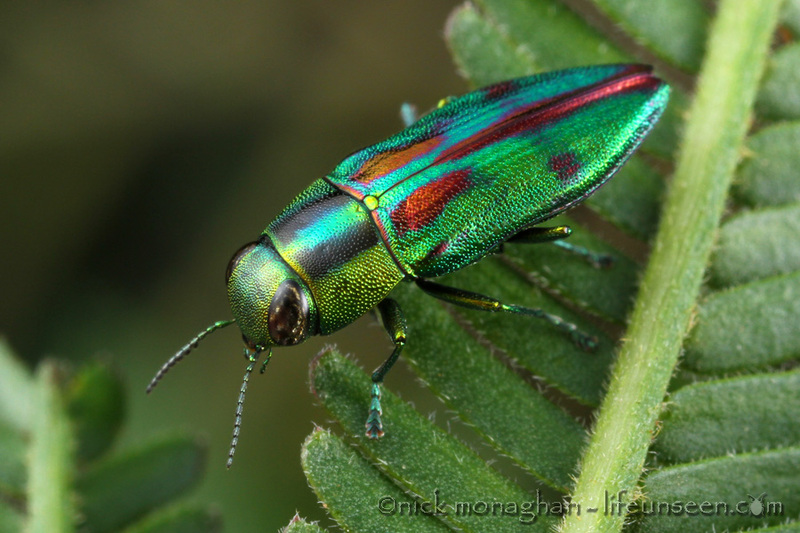 Please visit the Buprestidae gallery to see more photos of these living jewels. Castiarina wilsoni on a bed of Cassinia flowers.